Business owners who wish to become involved with fundraising have a number of different options. Not only can they give to a good cause but they can also claim tax relief on charitable donations. Apart from giving back to the community or giving to a favourite cause there are benefits to company fundraising. Many consumers will use the services of certain companies if they know part of their money is going to a charitable cause. Business fundraising is also a good way to bring in publicity for a company and maintain a favourable company image. Annual fundraising events are a way to interact with the local community, and this can be very beneficial for smaller businesses. Tax relief in the form of Gift Aid is another option open to business owners who make charitable donations. Company websites are a great way to advertise fundraising events. Many businesses will give a percentage of their profits to charity. This can easily be achieved by stating on the website that a certain percentage of the profits will be donated to a charity. The decision over the nominated charity will be entirely up to the business owner and employees. Small businesses may find that nominating local charities will be beneficial and can actually help increase business sales. Giving a percentage of the profits can be an ongoing concern or there can be a set time period for this fundraising activity. Annual business fundraising events are another way to give to a good cause and attract publicity. Fundraising events such as golf tournaments and come to work in pyjamas days are also something for employees to look forward to. These events can be run throughout the year and can turn into regular calendar dates. 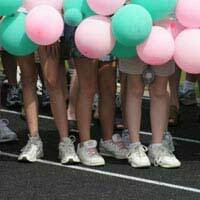 Events such as sponsored runs will allow employees, family members, business contacts and customers to become involved in the fun. This type of fundraising is especially beneficial for start-ups that wish to publicise their company within the community. The price for publicising a business fundraising event can negligible. Businesses that do run fundraising events will usually attract the attention of local radio stations and the local press. Media attention can make a major difference to fundraising events and can bring in a great deal of customer interest. Businesses can consider giving to local good causes, local charities or providing equipment for local schools. It shouldn’t be too hard to negotiate with companies that can print flyers for fundraising events. Emails to customers and business suppliers are another easy way to advertise fundraising events. Business fundraising evenings are one of the simplest and most popular ways to raise funds for a good cause. Good business negotiators should be able to obtain discounted prices on the venue, and food and entertainment for the event. Dinner, dancing and a range of fundraising events can take place during the evening. These can include auctions, bingo and race night events, and tickets for the dinner can be sold to employees, family and friends. The fundraising dinner can be a one off event or can be the highlight of the fundraising year. Business owners who do donate to charity can claim a certain amount of tax relief through the government’s Gift Aid scheme. This tax relief can be claimed whether the donation is a one-off occurrence or an ongoing concern. The business will simply deduct the charitable donation as a ‘charge’ when assessing company profits for tax purposes. This tax relief can be claimed by sole traders and companies. There are some restrictions and eligibility requirements with Gift Aid, and full details can be found at the HM Revenue and Customs website. Raising funds for a good cause can be a great way to enhance a businesses reputation and help local charities. Fundraising is an excellent way for businesses to say thank you to their local community. Employers should find that employees will always be eager to help out when it comes to raising funds for good causes and charities.